Chennai, Nov 8 (IANS) The Tamil Nadu government has requested the Centre to carry out annual maintenance work at the Kudankulam Nuclear Power Plant (KNPP) during May-September period when wind power generation is high. In a statement issued here, the state government said Tamil Nadu Minister for Electricity, Prohibition and Excise P. Thangamani on Thursday met Union Minister of State (Independent Charge) of Power and New and Renewable Energy R.K. Singh and Piyush Goyal, Union Minister for Railways and Coal in New Delhi. 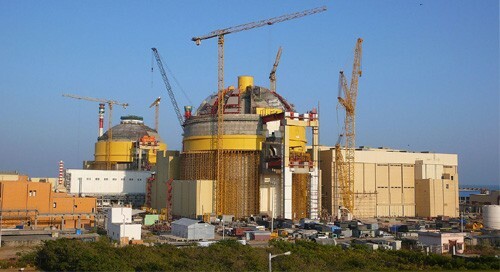 According to the statement, a request was made to Singh that annual maintenance of the nuclear power plant at Kudankulam be carried out during May-September when the wind power generation in the state is high. The Nuclear Power Corporation of India Ltd (NPCIL) has two 1,000MW nuclear power plants at KNPP in Tirunelveli, about 650 km from here. The first 1,000MW atomic power unit is under annual maintenance and shut down from August 1, 2018 and is expected to be synchronised to the southern grid on November 14. Preliminary work towards restarting the unit is underway, an NPCIL official had told IANS earlier. Thangamani also pointed out to Singh that Tamil Nadu should get 6,312MW of power from the central pool while it gets only 3,376MW. Thangamani requested Singh him to supply the full entitlement from the central pool. At his meeting with Goyal, the Tamil Nadu Minister requested the former to arrange 20 train loads of coal daily for the thermal plants in the state, the statement said. The thermal power plants in the state need about 72,000 tons or 20 train loads of coal per day. Thangamani also requested Goyal for coal allocation for the upcoming thermal power projects in Tamil Nadu.